“That makes me angry,” said mom. “How could someone do that?” added dad. Stephen and Michael cowered at what they said. They hadn’t meant to start the fire. They were just making a campfire. They tried to put it out but it got away from them. They were scared to tell because they just knew they would be thrown in jail. The guilt was unbearable. Oh my oh my. On our recent trip to Patagonia, we visited Torres del Paine National Park, a rare gem of natural beauty. Just a few months ago a careless tourist built a campfire even though it was posted everywhere that is was illegal. He caused a wildfire that burned thousands of acres of park land what will take years to recover, destroying the homes of countless foxes, guanaco and other animals who called the park home. It was heartbreaking to see the charred hillsides. Nice writing, Ross. Gave me chills, though, remembering how sad it was to see the blackened remains. Just recently, Australia was listed as the number one place for bush fires in the world. It’s always a concern here during the hot summer months. We have problems at times with deliberately lit fires, accidental fires as in the story, and fires from lightning strike and other natural causes. From my home I’ve seen flames leaping high from trees. In the case of children in my classes, I would often talk about the dangers of open fires in summer. I’ve seen photos of Torres del Paine National Park and understand the tragedy of fires in national parks, having had one group of children I taught do environmental surveys of plant regrowth over a year following a large fire. The person ignoring the signs is negligent whereas the boys in the story were ignorant of the risks. The results are the same. This is exactly what started the Aspen fire in 2003. Two campers left their campfire before it was completely out, and it flared up and spread, burning more than 83,000 acres. With a background in scouting, I very early learned the need to properly extinguish a campfire but I have found evidence when hiking of those who don’t. The Aspen fire is an example of how things can go wrong if we are careless. I watched news reports of that fire here in Australia. It is all too similar to some of the fires we have here. Each summer, it’s not a question of if a wild fire will start, it’s more a question of where. Great story. I am sure this happens more than we realize. Can you imagine the guts it would take for kids to admit something like this? If children brought up enough courage to tell the parents who then passed on what had happened it would have to be taken into account. Children can make mistakes, even tragic ones. What they do about their mistakes can mark their character. A couple years back some boys decided to try to set a small wooden bridge used by children to cross a reed covered swampy are in the local park. What they didn’t expect was for the reeds to catch fire and flare rapidly along the creek needing two fire trucks to attend. Two of the three boys ran off while one stayed and tried to extinguish the fire knowing he would be caught. He made a mistake but was willing to accept the responsibility. Not for the fire but for his taking responsibility, there is admiration. my brothers almost started a fire in a camp ground, years and years ago when they were quite young … boy did they get a whooping from Dad. Sadly this happens all too often … i do wish people would think of the needs of the greater world rather than just their own immediate needs. Yay, dad! It’s most important children making such mistakes have it clearly pointed out the danger of carelessness and the consequences. For younger children, the fun of the action hasn’t been thought through. This becomes negligence when we see adults, who should know better, do such things. I was in a state park one time when I saw a ranger run past me. I turned to see what was happening on this hot summer day. A family had set up a charcoal burner over long grass and was about to light it. There was a total fire ban in force. My husband’s brother set a whole mountain on fire in Utah one summer. Just messin’ around. Fortunately, there were no homes in the area where the fire burned. Children make mistakes because they often can’t see too far past the immediate. It’s most dangerous when someone reaches adulthood and still lacks the ability to look at the consequences of their actions. I’m glad your brother-in-law’s mistake didn’t lead to loss of homes. I’m sure it resulted in a lesson learned. Oh my goodness, I just couldn’t imagine living and being so close to this! 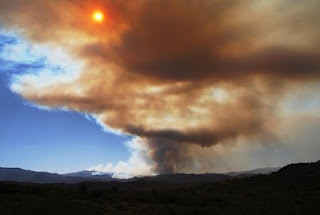 As my town is surrounded on three sides by national parks, fires can be a concern during summer. Now we are about to enter summer, the controlled fires are under way to reduce the chance of major fires. I once set a field on fire…which turned into a nightmare…and a really funny story finally years and years later. Thanks for this story. It brought back some intense memories. I admire the kids for having the courage to stand by what they did! Your pieces are always so believeable Ross. There is a little bit of truth in the story. Three boys had accidentally set reeds on fire. They had been trying to set fire to makeshift wooden bridge. Two boys ran off but one stayed and tried to put it out knowing he would be caught. Credit to the one who stayed, it helped when he faced a magistrate. The other two boys weren’t as lucky.